The new Toyota Supra was sort of half-revealed at the 2018 Goodwood Festival of Speed. While we didn’t get a clear, camo-free look at the car, keen eyes on the ground did make some interesting observations about parts that the Supra appears to share with BMW. My friend Jake Stumph, who writes for a whole bunch of car sites, dropped me a note last week that the Supra seemed to share brakes, tire sizes, a heads-up display, and surprisingly to me, a windshield, with the BMW M4. As Stumph posted on Scionlife, a Facebook post from somebody called Moto Miwa from Club4AG featured a bunch of detail photos of the new A90 Supra that made these apparent connections clear. The four-piston brake calipers on the Goodwood Supra look exactly like the ones on the M4. Stumph went on to extrapolate that the “...BMW brakes means the Supra is packing BMW 5×120 hubs, and, likely, a BMW-derived suspension.” I suppose the matching tire size could support that theory as well, since that would make the M4 and Supra’s geometry similar in one more way. If the Supra and BMWs ride on the same wheels and hubs, I guess it’s not a huge stretch to say the bits behind them might be similar too. And, I suppose, the upcoming Z4 convertible will likely be similar as well since that’s supposedly being co-developed with the Supra. As for the windshield, Pilkington #43R-001622 is indeed the OEM glass on the BMW M3, M4 and some 5 Series cars. According to forums it’s not popular with owners, but it’s an interesting piece to share across platforms. Finally, the Goodwood Supra’s VIN is WZ1DB4C5XKW000003. The NHTSA cannot decode that one, but we can crack it open manually. The first digit indicates where a car is built, and “W” means Germany. The second two digits are supposed to indicate the manufacturer, but I can’t figure out how to decode “Z1.” Perhaps because this will be the first German-made Toyota/BMW joint venture. But, again, good old Bozi had the inside line: he told me that “WZ1” belongs to BMW Munich. 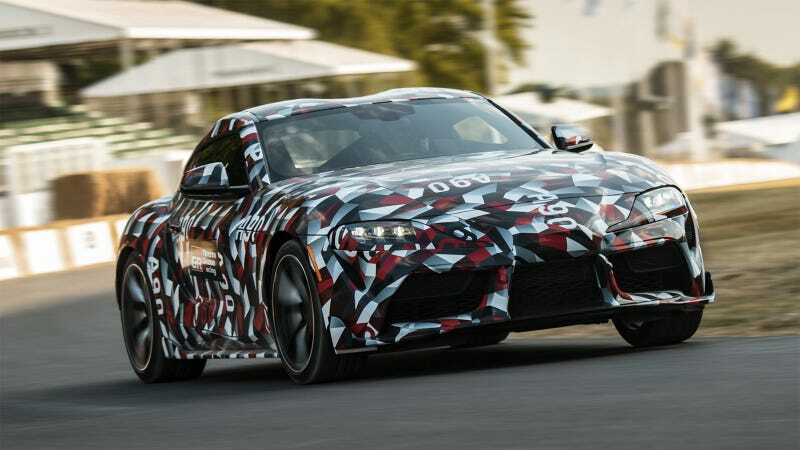 Meanwhile, in a recent post on an official Toyota blog, the new Supra’s Chief Engineer Tetsuya Tada recently confirmed that the car is “actually the same level of rigidity as the Lexus LFA supercar, and it has been achieved without using carbon fiber so we could keep the price point at an affordable level. That was the most difficult thing to achieve.” Tada also said that the Supra would have “twice” the rigidity of the Toyota 86, but didn’t say anything about BMW or the ongoing collaboration between the two companies. According to TopSpeed, Tada had previously said “[the Supra is] different to the Z4; they are two different cars. We didn’t start by finding common parts. We worked on our own ideas to see what cars we wanted to create, then we shared ideas to identify where we can share common parts,” at the Geneva Motor Show a few months ago. TopSpeed also reports that the Supra, along with the next BMW Z4, will be built in Austria which is inconsistent with what’s stamped on the VIN (VINs for Austrian-made cars should start with VA or VE) so perhaps the number on the demo car’s dashboard isn’t something we should read into too much. Despite being a little bored of being teased by the new Supra, I’m still excited to see its final form and I think details like what we’re discussing here are interesting, if trivial. It will be neat to see and drive what a BMW/Toyota collaboration really ends up looking like.